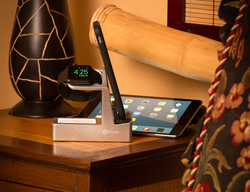 iNZeyo Labs, the company behind the $456,000.00 Basecamp Apple Watch and iPhone Dock on Amazon.com, has launched a Kickstarter campaign for the next generation of its popular docking stand, called Basecamp Deluxe. iNZeyo Labs, the company behind the top selling Basecamp Apple Watch Dock on Amazon.com, has launched a Kickstarter.com campaign to raise funds and awareness for the next generation of its popular docking station, called Basecamp Deluxe. Users who have every kind of cool device that Apple has made know it can be a challenge to find a nice tidy place to charge them all without taking up a lot of space or creating a messy cord jungle. Basecamp solves that problem with an all-in one, compact, space saving charging stand for the Apple Watch, iPhone and tablets. It has a built-in LED nightlight, and its small footprint and hidden cable management system reduces clutter on the owner’s nightstand or desk. Kevin King, founder of iNZeyo Labs, says many improvements and customer suggestions have been incorporated into the new Basecamp Deluxe version. Some of those include a built-in Bluetooth Speaker, ability to put the watch in nightstand mode, a fourth USB port, adapters for most countries of the world, the ability to better dock large cases such as those from Otterbox, and a host of other user requested improvements. The Kickstarter campaign ends on August 5. The first level reward has already completely soldout, and additional reward levels are beginning to fill up. iNZeyo Labs will release Basecamp Deluxe in December 2016, with guaranteed delivery worldwide before Christmas.